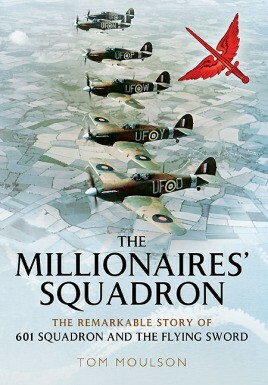 Imagined by an aristocrat in White's Club, London in 1925, a part-time squadron of wealthy young men with their own private aircraft was incorporated into a newly-established combat-ready Auxiliary Air Force, first as bombers, then fighters. The pre-war years combined serious training with frivolity and mischief, but the outbreak of war in 1939 changed that. Despite their social rank the pilots were thrust into the heart of the action, with mortality proving to be the great social leveler. From pampered pre-war lifestyles to perilous front-line deployment, their career trajectories featured the kind of radical changes of pace and focus that war alone engenders. In the process, the surviving members of 601 were changed forever. Through the battles of Britain, Malta, the African desert and Italy the squadron's composition was transformed, and by war's end only a minority were British and none were millionaires. Britain had changed too, and the re-formed squadron filled with a combination of veterans and young middle-class ex-service pilots. The pilots flew Hurricanes in the Battle of Britain, and Spitfires thereafter until the arrival of jets in the '50s; DH Vampires and Gloster Meteors. The one aircraft they could not master was the little-loved mid-engine P-39 Bell Airacobra in 1941. Disbandment in 1957 of the by-then 'Royal' Auxiliary Air Force was fiercely resisted, but inevitable. Originally published in 1964 to great acclaim, this second edition features a wealth of brand new content in the form of newly uncovered documentation and photo illustrations. It is set to bring the story of this eccentric and dynamic squadron to a whole new audience of aviation and military enthusiasts. Tom Moulson is a retired business executive and former pilot on 601 Squadron (County of London) Royal Auxillary Air Force from 1950 until its disbandment in 1957. This book is based on his earlier one published in 1964 and titled The Flying Sword: The Story of 601 Squadron. Taking advantage of the wealth of new information that has come to light since the first edition was released, this new edition looks set to bring the eccentric, often scandalous, but ultimately heroic endeavors of this intriguing branch of the RAF to a much wider audience. Tom currently resides in California.